After the Events of The Avengers, Captain America and The Black Widow team up to expose an ever growing conspiracy. Watch the very first official trailer below. 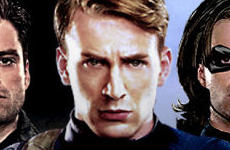 Captain America The Winter Soldier comes out on April 4 2014. Below are your top most asked questions. How come Captain America doesn't just ask The Hulk for help? That's a great question. To answer your question, we really have to think about where it all started for the team. One thing I always like to tell people is how much work the crew really puts into creating such an awesome feature. It really would not be possible without them or, of course, the fans. Will we get to see Chris Evans naked this time? Is Captain America the Winter Soldier? Here is The Winter Soldier just walking around, minding his own business.